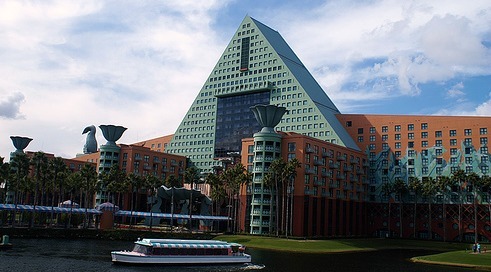 The Disney Swan and Dolphin Hotels are award-winning sister resorts in Walt Disney World. Nestled on the shores of Crescent Lake in the Epcot resort area, the resorts were designed by famed architect Michael Graves. The Swan and Dolphin house a combined 2267 rooms and suites. Owned by Starwood Resorts, the hotels are touted as deluxe resorts. The Disney Swan and Dolphin boast a large convention center, five pools, 17 restaurants and bars, a wide variety of recreational options and an awesome location in the center of Walt Disney World. The Disney Swan and Dolphin resorts are owned and managed by Starwood Resorts, the parent company of Westin and Sheraton.The Swan has 758 rooms and the Dolphin has 1509 rooms. Designed by the famous American architect Michael Graves, these whimsical hotels face each other were designed to be viewed from each other. The resorts opened in 1990 and are decorated in sea foam green and peach tones with images of giant waves and banana leaves on the exteriors giving it a tropical flair. Huge images of swans and dolphins adorn the exterior of their respective hotel. Attractive landscaping with fountains and tall palm trees complete the island feel. The resorts are beautifully lit at night. This AAA Four Diamond resort has won many awards in the hotel, dining, catering and meeting industries. The hotels were recently remodeled. The decor is fun and whimsical, though somewhat loud. The Disney Swan and Dolphin Resorts were designated as a Florida Green Lodging Property by the Florida Department of Environmental Protection. The resorts utilize many eco-friendly practices, including in-room recycling, paperless (electronic) communications, motion-activated lights and organic cleaning products. Toilet and sinks are automated with water-saving devices. Bed linens and towels are changed only on request to conserve water. Guests can decline housekeeping services for a $5.00 food/drink voucher or 500 Starwood points. The resort uses eco-friendly pest control and paint products. Organic and vegetarian dining options are available in the restaurants and convention center. Rooms are all non-smoking. A variety suites, concierge and handicapped accessible rooms available. Room rate start at $139 per night with packages available. Check in 3PM and check out is 11AM. Rooms have standard, lake, resort or Epcot views. Some rooms have balconies. The Disney Swan and Dolphin charge a daily mandatory resort services fee of $17 which includes two bottles of water daily, high speed internet and health club. In 2011 Swan & Dolphin rooms were refurbished in attractive earth hues. The lobbies were refurbished in 2006. The Swan and Dolphin cater to a lot of conventioneers and foreign tour groups. The Dolphin is more business oriented and quieter than the Swan which caters more to families. Transportation is by boat to Epcot and Disney Hollywood Studios. You can also walk to Hollywood Studios or Epcot’s International Gateway in ten minutes. Boats are shared with Yacht and Beach Club and Boardwalk Inn. Buses serve other areas. The Swan and Dolphin hotels charge $15 a day for for self-parking and $20 a day for valet. Room charging privileges are only good at the Disney Swan and Dolphin Resorts, not the rest of Walt Disney World. Disney Swan and Dolphin guests are ineligible for Disney Magical Express and Disney packages, including the Disney dining plan. The Dolphin is 27 stories high with 9 story wings. Upper level rooms afford fantastic views of Walt Disney World. The Dolphin Hotel sports a triangular shaped tower and the exterior is brandished with a banana leaf motif. Giant dolphins decorate the exterior of the building. Beautiful lush vegetation surrounds the luxurious resort. Rooms have large bathrooms with separate vanity area. 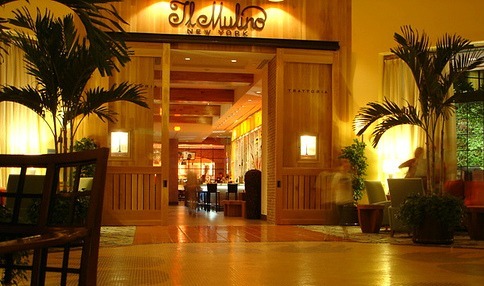 Dolphin is the larger of the two hotels with about 1500 rooms and has a grander lobby. Rooms have either a king or two double beds. Bathrooms have one vanity (Swan rooms have two). The Disney Swan is 12 stories high with 7 story high wings. 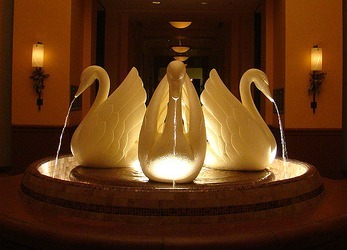 Two giant swans adorn the hotel. The exterior is covered with images of huge tropical waves. The Swan is the smaller of the two resorts with about 750 rooms. Rooms have a king bed or two queens. The bathrooms have two vanities with one in the bathroom. The Swan and Dolphin offer a lot of discounts including AAA, discounts for nurses, teachers, Starpoint point redemption, military and annual passport discounts. Visitors give the Disney Swan and Dolphin Hotels mixed reviews with some reporting that rooms need updating, though they were refurbished recently. Some have housekeeping complaints while others report clean rooms. The design and décor are visually interesting and engaging, but will not appeal to everyone. Also beware that there is not a lot of overt Disney theming. The resorts also have five lounges and 24 hour room service. Disney Vacation Club membership entitles you to 20% discount at most Disney Swan and Dolphin restaurants (except Todd English’s bluezoo and Shula’s Steak House). Most restaurants also accept the Tables in Wonderland discount. The Swan and Dolpin offer refillable mugs, but the Disney Dining Plan is not available. Bell services and self-service laundry facilities (coin-operated) are available. 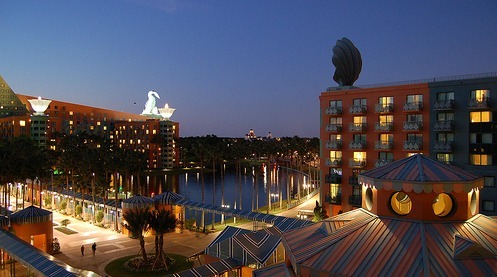 The Disney Swan and Dolphin are a change from the typical Walt Disney World hotel. The fanciful theme fits nicely in Walt Disney World, but there is a lack of overt Disney theming (this can be positive or a negative, depending on your taste). The resorts are sophisticated, but lack the Disney touch. The Swan and Dolphin are eco-friendly, in a great location and offer a wide variety of activities and dining options. It is relatively easy to get a nice discount on a room rate, but beware of the added taxes and fees.